Package Deal: $89.00 for 21-hour block. Fulfilling your real estate continuing education requirements is convenient and easy with our online classes. You can enroll and start your real estate CE classes anytime. 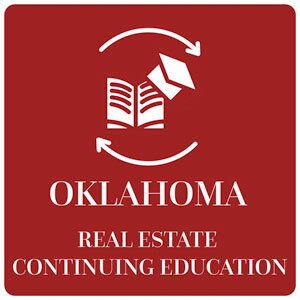 We will send your continuing education completion hours to the Oklahoma Real Estate Commission electronically. You will also be able to download a certificate upon completion of each class for your records. Real estate sales and broker associates need to complete at least one hour each in six required topics, with the remainder being made up of elective. Real estate broker licensees are required to complete the 15-hour Broker in Charge real estate CE class in addition to completing at least two of the six required subject matter CE classes, equal to at least six hours. If you are a provisional sales associate, you will need to take the Basic II Post-License course. Questions? Call us at 800-369-7277. We've made the enrollment process easy by providing you with continuing education packages for each type of real estate license. The continuing education packages below include the classes required for that license. You can enroll today by selecting your continuing education package. Class Objectives: To examine the recent law changes that are effective as of November 1, 2013, and also review the parts of the law that have not changed. You must login before viewing this class. Class Objectives: In this course (Course#173855), we will examine the history of Fair Housing Laws, the practices that are considered discriminatory, and what agents can do to avoid violations of the Fair Housing Laws. To view course description click here. Class Objectives: Oklahoma licensees use a number of contracts and forms in the day-to-day workings of their business. In order to avoid any potential liabilities, it is critical that all licensees use the most updated forms available to them. Class Objectives: This course examines some of the changes to the Oklahoma Real Estate License Code and Rules, discuss and view a case and consent agreements heard by the Oklahoma Real Estate Commission. Class Objectives: This courses discuses broker supervision. Class Objectives: Environmental due diligence is an essential component in most real estate transactions. This course will introduce and familiarize real estate students with the history, definitions, and current issues involved with many different types of environmental issues. To view course description click here. Class Objectives: We will examine the most common addenda and other forms. Since the use of listing agreements is a critical activity for licensees, we will also examine a listing agreement in detail. Class Objectives: This class consists of four units that introduce students to the introduction to property management, leases, types of management, and issues of concern. Class Objectives: We will discuss the changes that are now in effect in the industry and the requirements for using the new forms. Class Objectives: In this course, we will discuss the structure of the National Association of REALTORS®’ Code of Ethics, review recent changes to the Code, and examine case studies that relate to specific Articles of the Code. Class Objectives: In this course we will look at fair housing violations that oftentimes go unnoticed because they have been institutionalized and are hidden by operational procedures. In addition we will look at several affirmative housing programs currently in place.